If you are like me and have even a wee bit o’ Irish in you AND you live in the Pittsburgh area, you are craving the St. Patrick’s Day Parade…but it’s still six months away. Lucky for us, there is an annual Pittsburgh Irish Festival held near the half-year away from “our” day. Our adventure to the Pittsburgh Irish Festival was last Saturday, a rainy day in the city. Greg commented that “you Irish folks don’t seem at all phased by the rain” – and he’s right. Arianna, Evan, Isla, and I were sniffing, dancing, and laughing our way through the rainy(?) festival while he and Ava trailed behind (poor Ava couldn’t test out her Irish because she was being worn by Daddy, or I am sure she’d be doing the same). Unfortunately, we got there after the Children’s Area had closed for the day, but there are fun games, crafts, and a reading center for the kids. There’s food, fun, music (FOUR stages! ), vendor booths, and of course, whiskey. We’re already planning on asking my brother to join us for a day there next year, kilt and all. Evan kept asking to go back on Sunday, even though we had other plans. I’d say our experience, albeit brief and rainy, was AMAZING and we can’t wait to do it again. Did you happen to make the festival this year? What did you love most? The Pittsburgh Irish Festival is held at the Riverplex at Sandcastle. 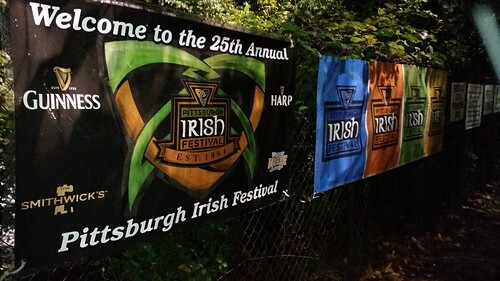 The 2016 festival is September 9-11 (mark your calendars now and follow along on Twitter @PittsburghIrish!). This entry was posted in Pittsburgh Fun and tagged Irish Festival. Bookmark the permalink.